Each season Chef Jacques Qualin carefully-crafts a new menu perfectly-suited to the coming months. Keeping the flavors of spring in mind, this season Chef Qualin has taken inspiration from his experience as an avid outdoorsman and time spent immersed in the rustic farmlands of France’s Franche-Comté region, which at a time he called home, to craft a palate-pleasing menu brimming with the freshest ingredients available and a prime selection of seafood and meats. While difficult to choose favorites, these are a few standouts from Chef Qualin’s new spring season menu. Featuring a prime cut of beef tenderloin, this protein-packed dish is accented with spring flavors like charred fava beans, spring garlic, and parmesan. At J&G Steakhouse, we offer a global selection of seafood. That includes the new Striped Sea Bass. 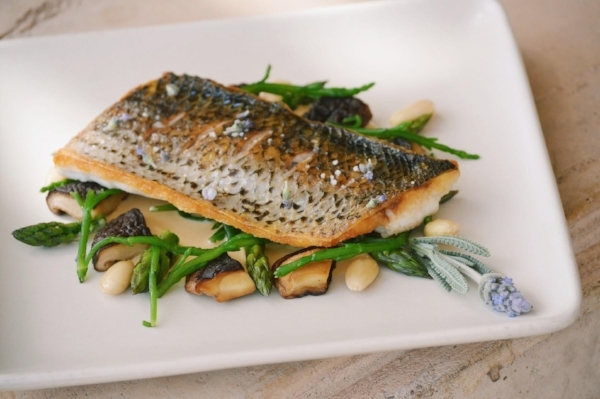 This dish is served with fresh asparagus, shiitake sesame vinaigrette, and sea beans. Sea beans, which are also known as samphire, pickleweed, glasswort, or sometimes sea asparagus, are a slightly salty green sprout that commonly grows by the seashores. The green sprout has made it ways to the southwest, and can be found growing in vegetable gardens and for sale at farmers markets. Chef also uses locally-sourced lavender to accent the dish. This creative soup will certainly surprise your tastebuds. Chef’s Sweet Pea Soup is poured over a layer of creamy and airy parmesan foam, combing all the best flavors of spring. And, this soup makes for a suitable starter to any meal.